Yet many IROs are only vaguely acquainted with the whole expert network concept. These networks perform many functions, but primarily identify and recruit individuals who, for a fee, advise end-users performing research or doing due diligence, explains Albert Sebag, CEO of Guidepoint Global, an expert network based in New York. The good news for IROs is that unseen experts may be helping you tell your story to investors. The bad news? IROs don’t know how to ensure these non-policed conversations are accurate, and they can’t necessarily undo anything harmful that’s shared. Today there are more than 45 expert networks, according to Integrity Research, generating between $400 mn and $450 mn in sales in 2008. Mayhew estimates they make up approximately 20 percent of the overall independent research industry. Seismic changes in Wall Street research may have given birth to expert networks, but the next stage of growth could come from the recession – and a pressing desire to mind the bottom line. 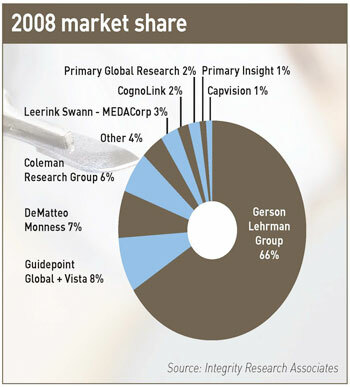 Of all the expert networks, GLG is the largest, with 66 percent market share, according to Integrity Research. Goldman notes that GLG is gaining between 200 and 300 new experts a day. At the same time, new entrants are regularly appearing on the scene. In May independent investment bank Noble created a UK and Indian expert network to provide independent market insight to the buy side. 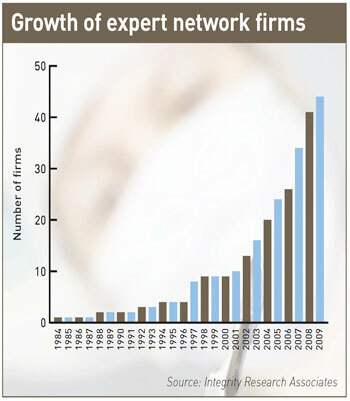 Often an expert network’s beginnings shape its approach. Clients at DeMatteo Monness, a Manhattan-based broker-dealer, receive expert consultations as an extra service in return for brokerage fees, says David Shook, managing director and director of research at the firm. Although this model is not the norm for expert networks, other broker-dealers have also attempted to enter this arena: Bear Stearns spawned Primary Insight, which recently underwent a management buyout, and Goldman Sachs launched Vantage Marketplace. For GLG and other firms dedicated exclusively to the expert network arena, clients generally subscribe to one or more of the company’s practice areas and then the expert network pays each of the advisers predetermined fees. Courtney Kling has experience of expert networks from both sides of the equation, as a client and now as an expert paid by GLG. After retiring from a large institutional investment company, where she worked as a pharmaceuticals analyst, Kling founded Courtney Kling Consulting, based in Park City, Utah. In her role as an industry analyst, Kling often analyzed a new drug or a specific therapeutic condition by talking with two or three healthcare professionals identified by GLG. For instance, when Merck unveiled its HPV vaccine, Kling turned to GLG for help. ‘You get a real primer on the medical condition,’ she says. ‘Being a financial person, rather than a medical person, it was very interesting and informative.’ She notes that the average consultation lasts 30-45 minutes. Today, Kling accepts roughly one GLG consulting assignment a month, usually on a topic related to private equity investment in healthcare. She receives consulting requests from GLG by email, and can accept or decline. Building on that idea, GLG unveiled its C-Series in June. The expert network hosts small group or one-on-one meetings with members of a company’s management team and a few investors. Foot Locker, RSC Holdings and ALLETE have all used the C-Series as a way to extend their IR reach. IROs might also turn to expert networks to hone their targeting and other intelligence-gathering skills. Although only a handful of IROs have demonstrated an appetite for expert networks’ services, this could change. Laurence Herman, general counsel and a managing director at GLG, believes IROs might use experts as a way of researching potential investors and targeting new prospects. Do moonlighting employees jeopardize Reg FD? For IROs, one of the chief worries surrounding expert networks is whether participating employees might fall foul of Regulation Fair Disclosure and insider trading rules. Will employees acting as experts represent their companies well – or will they spill important secrets? Some marquee-name companies prohibit employees outright from participating in expert networks during their employment or even within the six months after they leave. A widely cited 2006 Wall Street Journal article notes that Verizon Communications, Citigroup and Applebee’s International didn’t want employees working with Gerson Lehrman Group (GLG), the largest expert network. On the other hand, some companies will consider having their employees serve as ‘experts’ as long as some well-defined rules and restrictions are established – an appealing opportunity. Because expert networks would naturally prefer companies to take the latter view, the largest have set out to understand and address public companies’ concerns. ‘Expert networks and their clients are taking compliance much more seriously,’ says David Shook, managing partner and director of research at DeMatteo Monness. GLG managing director Andrew Goldman makes a similar point. ‘We proactively go out to companies and ask them for their policies on this issue so there’s no confusion whatsoever,’ he says. Laurence Herman, managing partner and general counsel at GLG, says experts employed by public companies sign a contract prohibiting them from discussing confidential matters. In addition, he points out that GLG requires all experts to complete an annual tutorial on the limitations of what they may discuss. Widely acknowledged as the largest of the expert networks, GLG has more than 200,000 subject matter experts within its database. The company facilitates more than 12,000 phone consultations per month for its roughly 850 clients. Of those, more than 300 are hedge funds and 100 are either mutual funds or investment managers. The largest of GLG’s practice areas is healthcare with more than 60,000 experts, but the firm also specializes in accounting and financial analysis, consumer goods and services, energy and industrials, says managing director Andrew Goldman. Guidepoint, which grew substantially in May after it acquired another large expert network, Vista Research, now has 130,000 expert advisers in its database, says CEO Albert Sebag. Experts are concentrated in technology, media and telecoms (TMT), healthcare, industrials and consumer retail. Sebag says Guidepoint arranges roughly 100,000 interactions annually. Founded as a broker-dealer in 1997, DeMatteo Monness launched its expert network in 2003, according to managing director David Shook. He says the firm has ‘tens of thousands’ of experts and more than 200 clients, ‘the vast majority’ of which are mutual funds, hedge funds and private equity firms. Areas of concentration include TMT, consumer retail, energy, industrials and healthcare. Established in 2003, CRG primarily manages research needs for institutional investors. It works with 150 clients around the world and has offices in New York, London and Beijing.